While I have reviewed a few indoor cameras, they are never something I am particularly interested in for personal use. There are two people in our house, no kids, no pets, and I am anti-social. So, I don’t really want or need a camera pointing at me all the time. 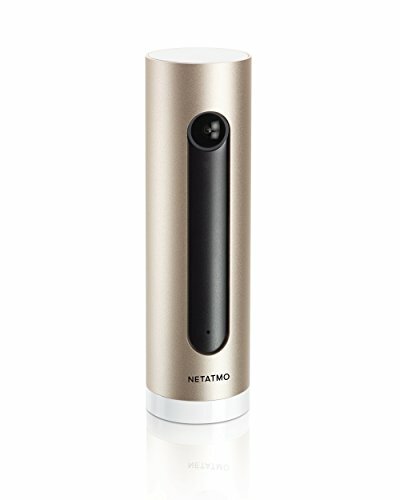 The Netatmo Welcome is different from many of the competing options, it does all the usual indoor camera stuff, but it has facial recognition which can then be used for more intelligent alerts, or as part of a home automation system. One of the reasons why I am not so keen on indoor cameras is the thought of all the footage being uploaded online when I mostly look like a slob throughout the day. There have also been numerous privacy concerns in recent years, especially with large corporations, I already have enough personal information stored on the likes of Facebook, I don’t need all my daily activities uploaded too. This is not an issue here though as all the footage is kept local on a microSD card. It is the facial recognition that stands out here though, I don’t really care what time my girlfriend gets in, or being notified when I walk into the room. But being notified when someone else is there is definitely something I would like to know. Furthermore, not only can you disable notifications for known faces, but it can also completely disable video recording too. It has other smart features built in too, it will use its microphone to notify you if it hears an alarm go off. Whether it be a smoke alarm, CO alarm, security alarm or siren, it will send a notification and record a video. If I did have a pet, I could choose if I wanted to be alerted to him/her moving around or not. As you would hope, there is IFTTT built in allowing you to trigger actions based on events. Using these you can develop automated events that are much smarter than PIR sensors systems like SmartThings use. So if it identifies that I have come home, I can have IFTTT turn the lights on, and start playing my favourite music. They are just predefined recipes, you can, of course, be far more inventive. It is worth noting the exact specifications of this camera, as it is different than a lot of indoor cameras. The main things are that this is not battery powered, so you need to plug it in, it has an ethernet port, and there is no cloud storage option. The camera has a 4MP sensor capable of 1920×1080, but beyond that, they don’t state the spec of the camera. A little Googling indicates this is 130° field of view. There is also a microphone built in. With the connectivity, you only get Wi-Fi 802.11 b/g/n (2.4GHz) and 100Mbit ethernet. Considering it is plugged in it would have been nice to see 802.11ac / Wi-Fi 5. Storage is via microSD and they include an 8GB card with it. The camera itself is an anodised aluminium cylinder, and there are no options to mount it, you have to place it flat on a surface. It is quite attractive as far as these things go, and it blends in reasonably well. As usual for IoT devices, you need the app and an account. Once that is set up you follow the instructions which includes flipping the camera over onto its head to put it into pairing mode. It was a bit slow to do pair up, but I managed to complete everything in one try. Once the camera is set up, you will want to locate it somewhere useful. However, I found that the power cable was quite short and with it being white it stood out quite a lot. Obviously, your mileage will vary, but I located it on a mantelpiece at first and it meant a long white cable dangling down. The camera is powered by microUSB, so it is easy enough to replace the cable with a longer one. With it in place, you will start to receive alerts when it detects movement and sees a face. At first, it doesn’t know who is who so you need to set up profiles then identify each face, the more you do the more accurate it gets. It is a bit laborious at first but it is necessary and eventually, it will know who is who with a good level of accuracy. With facial recognition set up, it will then use this to decide if it wants to record an event or not. This is also combined with home and away settings. Under profiles it does has geolocation to identify if someone is home or not, and if it has not seen a face for a while, it will set them away. You can tweak the settings to avoid being annoyed by motion alerts, so in my case, I disabled motion alerts. You can then have it use unknown faces to trigger recording and alerts, which worked out better for me. Under the profiles you can adjust the settings further, so I can be notified when my partner gets home, or just ignore her. Once I played with the settings enough, it mostly didn’t bother me, which is what I want. More importantly, it didn’t constantly record me every time it detected motion, which avoids that creepy feeling of having an indoor camera. When it does record an activity, you can either stream it or download it. I have found the downloads can be a little slow, and occasionally fail, which could be due to the low-speed Wi-Fi, I suspect ethernet will be more reliable. Using ethernet increased the performance considerably, but this is obviously not going to be convenient in a lot of situations. Recorded video is decent, night vision is clearn and you can easily make out the surroundings or people moving around. The wide andle lense easily covers an entire room. When I first set it up, I placed it in the living room mantelpiece, but this is also where the TV is located, even though it was side on to the TV and a reasonable distance away, it would alert me to all the new faces it saw on the TV, which was equal parts impressive and annoying. This, therefore, led me to relocate it to the kitchen, I would have used it in the entrance hallway but we don’t have a convenient plug socket. If like me, the thought of an indoor camera creeps you out a little, but you still want some form of indoor surveillance then this camera is the perfect option. That does make it seem a little niche, but I think most people would prefer to avoid a camera recording them each time they walk past it. The facial recognition is much better than I expected, though it does take a while to learn, once it has remembered who is who, it keeps notifications and recordings down to a minimum. Even though this camera has been out for a few years now, considering all the privacy concerns from major corporations like Facebook, as well as all the cybersecurity issues, including hacked baby cams, this camera is more relevant than ever, and for me probably the only camera I would consider using beyond my review period. I am still not sure if I need an indoor camera for my security needs, I have plenty of cameras outdoors, but I could end up using this for its superior home automation triggers compared to a PIR. It is not perfect though; the lack of battery and short power cable does restrict placement a little. It also costs a bit more than competing big brands, Hive, Nest and Arlo are all about £10-20 cheaper, however, in this case, there is no cloud subscription so long term it should work out cheaper. Facial recognition, with intelligent local recording, make this one of the most appealing indoor cameras for anyone concerned about privacy or interested in home automation.